This session will walk through the key plays you must have in your 2018 plan to increase sales and marketing alignment, drive pipeline and exceed revenue targets. You will see how Sage Software, which sells software to businesses of all sizes in Europe, North America and Asia, used these plays to achieve 6x higher opportunity conversions and 12x higher customer revenue. With a target market of 72M businesses worldwide, Sage used AI and Oracle Eloqua to transform their sales and marketing to drive global market leadership. -How to drive sales adoption and follow-up on leads provided by marketing. Malachi Threadgill, Masergy. Matt Senatore, Sirius Decisions. Nipul Chokshi, Lattice Engines. Like most revenue teams, you are likely looking to accelerate revenue success in 2018. How can you align your teams on a common set of objectives and the buying cycle? What role can ABM play and what are the key plays you can use to achieve quick wins and turbocharge results? This webinar will walk you through how Masergy, a leading networking and security solutions company, achieved their growth targets by aligning sales and marketing on their ABM strategy and taking a data-driven approach to scaling their ABM program for sustained growth. AI and data are key pillars of any modern marketing strategy. Learn from high-growth companies how they are leveraging AI and data to align with sales and drive account-first marketing and sales efforts. 3. Create contextualized buyer experiences and have personalized conversations using data. Presenters will also share campaign examples you can run to see quick wins and early success. Leading B2B organizations are executing full-steam on account-first strategies to increase conversions and drive pipeline. The thing they’ve all found is that taking a “crawl, walk, run” approach to executing on ABM is paramount to success. So, you’ve decided that 2017 is the year you’ll be “doing ABM.” You’ve got alignment with sales. You’ve put together a list of a few hundred (maybe even thousands) of target accounts. You’ve got a dashboard and/or report ready to measure results. Now what? Well, what kind of campaigns will you run? run winning ABM campaigns using a combination of creativity, data and AI. - What targeting strategies should you pursue and how do you go about actually doing the segmentation? With metrics like these, its not surprising that many companies are already doing ABM for their top 20 to 50 accounts. However, with predictive analytics marketers are able to scale their ABM programs beyond their top 50 accounts, to their top 500 or 5000! Demand generation teams now have access to more data on customers and prospects than ever before. Using predictive analytics, you can quickly turn mountains of data into high converting campaigns for each stage of the buyer’s journey. * Spot cross-sell and up-sell opportunities. Join Lattice for a guided tour of the marketing tech stack that powers Acquia's demand gen engine. In recent years, B2B marketers have been confronted with a barrage of new technologies and systems aimed at making them more productive, efficient and successful. But which technology investments are worth making and what do you need to know before adding new systems to your technology stack? Show Me Your Stack (#MKTGstack) is an ongoing webinar series featuring a roster of forward-thinking B2B marketers that provides a glimpse into the marketing infrastructure that powers their demand gen engines and serves as the critical backbone to their business. Everything from CRM and marketing automation to content management, business intelligence and analytics systems will be covered – basically, anything in the stack! Each episode features a different marketer who will walk you through their marketing tech stack, share their goals and explain how their teams are structured. Don’t miss this rare chance to see how the best in the business invest in and use marketing technology. Are you ready to add fuel to your lead engine with predictive scoring, but aren't sure where to start? View this Marketo LaunchPoint session featuring Lattice customers Joanna Kwong of FireEye and Dan Ahmadi of MuleSoft. Joanna and Dan will walk you through their companies' thought processes for on-boarding predictive scoring and how they went about vendor selection, implementation, roll-out, and education. What tools do marketers at Kapost rely on? Find out on Lattice's Show Me Your Stack! with Jesse Noyes. Jesse Noyes is the Senior Director of Marketing, Content and Product at Kapost. Before Kapost from Offerpop, where he was Director of Content Marketing. Before that, he was pumping out content and drawing up strategy at Eloqua. He got his start as a business reporter, first at the Boston Herald and then the Boston Business Journal, before jumping into marketing. You can hit him up on Twitter @noyesjesse. Join Lattice for a guided tour of the marketing tech stack that powers Uberflip's demand gen engine. Hana Abaza is the VP Marketing at Uberflip, a platform that helps marketers create, manage and optimize content experiences at every stage of the funnel to boost engagement and generate leads. A blend modern chic, tech geek and entrepreneurial hustle, she combines a data-driven approach with her knack for communicating inspired tech solution to mainstream audiences to get results. Find out what's in Five9's marketing tech stack in Lattice's Secret Sauce Series: Show Me Your Stack. Show Me Your Stack is an ongoing webinar series featuring a roster of forward-thinking B2B marketers that provides a glimpse into the marketing infrastructure that powers their demand gen engines and serves as the critical backbone to their business. Everything from CRM and marketing automation to content management, business intelligence and analytics systems will be covered – basically, anything in the stack! Doug Sechrist is Vice President of Demand Marketing at Five9, the leading provider of cloud contact center software. Before joining Five9, he served as Vice President of Demand Generation at Eloqua as well as Taleo. He has also held Corporate and Field Marketing positions at ZANTAZ, an Autonomy Company, Intira Corporation, and Ascend Communications. What tools do other marketers use? Find out in Lattice's Special Sauce Series: Show Me Your Stack! with Influitive VP of Marketing, Jim Williams. Jim Williams is a veteran marketer for early and growth stage tech companies. He loves bringing transformative concepts to market. Before joining the Influitive team he held marketing leadership roles at Eloqua, Unveil Solutions, Lernout & Hauspie, and several PR agencies. You’ve probably heard about companies that are evolving their traditional lead scoring practices to a predictive scoring approach, but you might be wondering how it really works, what kind of companies need it and how it really drives value. 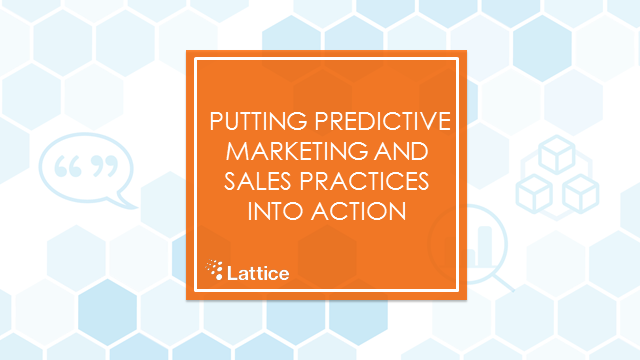 Get a glimpse into why marketers are adopting predictive scoring, how it compares to traditional scoring and what you should consider before you deploy. We’ll also look at some creative, out of the box use cases and review some case studies for how to successfully adapt your marketing and sales process to a predictive scoring model and handle the subsequent change management.